The Catholic leader visited a hospital in Dhaka run by the order of Mother Theresa on the final day of a visit to Bangladesh and Myanmar that has been dominated by the plight of the Rohingya. Pope Francis is known for championing the rights of refugees and has repeatedly expressed support for the long-suffering Rohingya, whom he has described as his “brothers and sisters”. The usually forthright pontiff walked a diplomatic tightrope during his four days in Myanmar the first papal visit to the country avoiding any direct reference to the Rohingya in public while appealing to Buddhist leaders to overcome “prejudice and hatred”. Among them was a 12-year-old girl who told him she had lost all her family in a Myanmar army attack on her village before fleeing across the border earlier this year. “Your tragedy is very hard, very great, but it has a place in our hearts,” he told them. The word is politically sensitive in the mainly Buddhist country because many there do not consider the Rohingya a distinct ethnic group, regarding them instead as incomers from Bangladesh. He had faced criticism from some rights activists and refugees for failing to address the issue publicly. The pope did not visit the refugee camps, where only a handful were aware that one of the world’s most high-profile leaders was championing their cause just 300 miles (around 500 kilometres) away. “It is the first time that a great world leader has listened to us,” said 29-year-old Rohingya teacher Mohammad Zubair. The two countries last month signed an agreement to begin repatriating refugees, but rights groups say they are concerned about plans to house them in camps away from their former homes — many of which have been destroyed. The pope returns to Rome on Saturday having led well-attended open-air masses in Bangladesh and Myanmar, which both have small Christian populations. In the morning he was greeted by hundreds of Bangladeshi nuns at the Mother Teresa House clinic, all dressed in the blue-and-white habit favoured by the woman who dedicated her life to the region’s poorest. 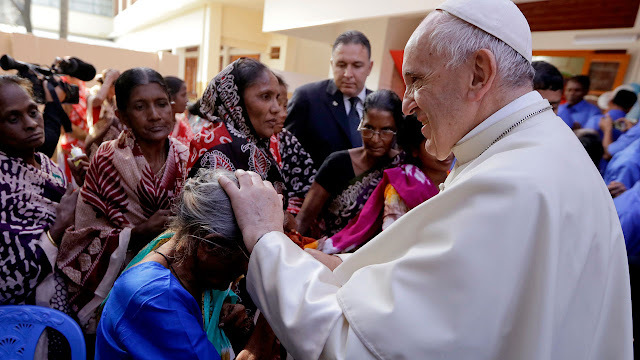 Earlier he paid tribute to the works of Catholics in Bangladesh, where schools and clinics run by the church provide a lifeline for poor communities.